Venus will be visible near the crescent moon Oct. 3, 2016. Here, it's shown at 7 p.m. local time. This evening (Oct. 3) as darkness is falling, be sure to look low toward the west-southwest part of the sky for a beautiful celestial tableau: a lovely crescent moon and the brilliant planet Venus. The moon will appear to hover about 5 degrees above and to the right of Venus. Your clenched fist held at arm's length measures about 10 degrees, so the moon and Venus will appear about "half a fist" apart. If you go out and face west-southwest soon after sundown on that day, however, you'll see Venus — but the moon will be nowhere to be found. What happened? The calculations break down, of course, because Venus is not stationary, but is moving in its own orbit around the sun. In fact, the next time the moon will pass Venus will come on the evening of Nov. 2. From our earthly viewpoint, Venus will appear to move considerably to the east against the starry background. Tonight, Venus will be in the constellation of Libra, the Scales. 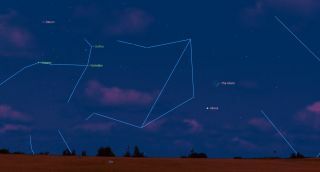 But by next month — Nov. 2 — it will appear to have moved about 38 degrees to the east, where it will reside in the non-zodiacal constellation of Ophiuchus, the Serpent Holder. So the moon has to travel that much more across the sky to catch up to Venus. Since the moon appears to move across the sky at about 13 degrees per day, it needs three more days (13 x 3 = 39) to catch up to Venus. Indeed, on Nov. 2, we will once again be treated to the eye-catching sight of the night sky's two brightest objects in our western twilight. We must also consider another factor: the Earth's movement around the sun. If, in fact, you do look for the crescent moon on Oct. 30 you won't see it because it will be at new phase and hence too near to the sun to be seen. That's because during the 27 days following Monday night's Venus-moon pairing, the Earth's movement around the sun will cause the sun's position in the sky to shift to the east as well. And so in this case, come Nov. 2, the sun will appear to have shifted right into the very same region that Venus and the moon occupied on Oct. 3. Of course, by Nov. 2, the moon will have moved well clear of the sun and once again will be readily visible in the west-southwest along with Venus. Now gleaming at a very bright magnitude of minus 3.9, Venus in the coming weeks and months will ascend dramatically higher in the western sky and by New Year's Day it will be setting nearly 4 hours after the sun. And by February — incredibly — it will gleam twice as bright as now. No other star or planet can come close to matching Venus in brilliance, not even bright Jupiter, which currently is hidden in the glare of the sun. During World War II, aircraft spotters sometimes mistook Venus for an enemy airplane. There were even cases where Venus drew anti-aircraft fire. And from Thanksgiving through Presidents' Day, it will dominate our evening sky.